James DePreist, 76, the distinguished conductor and educator, died Friday, Feb. 9, at his home in Scottsdale, Ariz., of complications from a heart attack last spring. 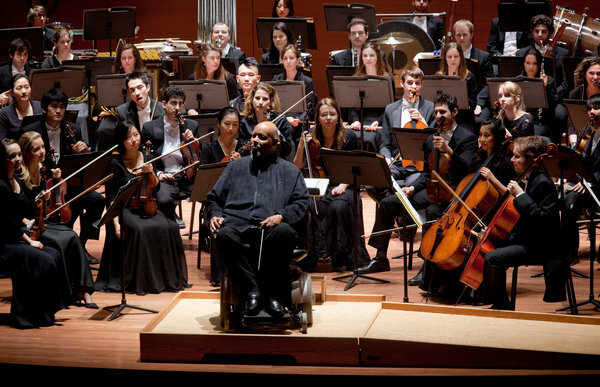 He defied both skin color and health problems to become a pre-eminent conductor. Maestro DePreist had a long association with the Julliard School, including, from 2004 through 2011, as a tenure as director of orchestral and conducting studies.He was a popular guest conductor as well as music director laureate of the Oregon Symphony. DePreist was one of the good guys. The music world has suffered a great loss. This entry was posted in Famous Conductors and tagged conducting, DePreist, James DePreist, Juilliard School, Julliard, Maestro DePreist, Music director, National Medal of Arts, Oregon Symphony, Scottsdale Arizona. Bookmark the permalink.